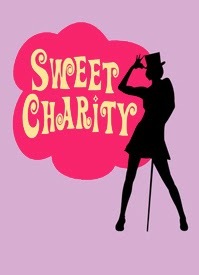 “Sweet Charity” was one of Broadway’s biggest hits. Tailored to the unique talents of the incredible Gwen Verdon, directed by the incomparable Bob Fosse, with a book by Neil Simon, score by Cy Coleman and lyrics by Dorothy Fields, “Charity “ couldn’t miss. And it didn’t. With that history as a challenge, director Mark Giza and choreographer Kathleen Delaney have recreated “Charity” in a fantastic Theatre Guild of Hampden production with a stellar cast of home-grown Talent…and that capital “T’ is not a typo. “Sweet Charity” is the story of a New York dance hall “hostess,” a girl who doesn’t just wear her heart on her sleeve; it is tattooed on her arm. Searching for love, Charity falls for every hopeless prospect that comes her way, always with the same result, but never without hope. Charity, played by Diane Fauteux, is totally convincing throughout in her acting, singing, and exceptional dancing. Her caring, warmth, and vulnerability are skillfully blended in an award-worthy performance. She is a pro! The entire cast is superb, especially Charity’s best friends, Nickie and Helene, played by Aileen Terzi and Chae-Vonne Munroe. The FanDango dancing girls are never carbon copy members of a chorus line. Each gives a meticulously conceived portrait of a distinct, individual character with Terzi and Munroe particularly memorable. Other standout performances are contributed by Heath Verrill as Oscar, Charity's latest prospect; Brad Shepard as Daddy Brubeck, who delivers a show-stopping “Rhythm of Life"; and Mark Gagnon who does the same with “I Love to Cry at Weddings.” Arnaldo Rivera is star-perfect as Italian matinee idol Vittorio who is amusingly matched by his girlfriend Ursula, delightfully played by Christine Arruda. In “Where Am I Going?” Charity’s fragile character shines through. “There’s Gotta Be Something Better Than This” and “Baby Dream Your Dream” each deliver with humor the underscore of frustrations and disappointments faced by the dance hall girls. Other powerful and better-known numbers include “Big Spender” and “If My Friends Could See Me Now." “Sweet Charity” is musical comedy at its best supported by a great score, a humorous yet moving story and most importantly performed by a cast that is never less than perfect.